Theater Review: Quill’s "Heir Apparent" Is Still Working Out the Kinks | Theater | Style Weekly - Richmond, VA local news, arts, and events. Aaron Sutten Matt Bloch performs as Eraste, Richard Travis as Geronte, Rachel Rose Gilmour is Isabella and Boomie Pedersen is Madame Argante in Quill Theatre’s “The Heir Apparent” by playwright David Ives, who also wrote last year’s best play award winner, “Venus in Fur,” staged by TheatreLab. With his original ideas, clever wordplay and touch of the absurd, David Ives is one of the finest playwrights practicing the craft. Perhaps seeing more successful stagings of Ives’ work makes Quill Theatre’s production of his play “The Heir Apparent” seem all the more lackluster. Like a number of Ives’ works, it’s an adaptation of a 17th-century play with a fair amount of modernizing. Originally Jean-Francois Regnard’s “Le Legataire Universel,” the play concerns Eraste (Matt Bloch), a young man who wishes to inherit the riches of his ailing uncle, Geronte (Richard Travis), so that he may marry his beloved Isabelle (Rachel Rose Gilmour). A wrench is thrown in Eraste’s scheme when Geronte announces that he will marry Isabelle, leaving a pittance to Eraste and his other relations. Eraste isn’t about to take this lying down, and he and his underlings go to great lengths to obtain Geronte’s fortune, including dressing up as a trio of pig women. While the cast works hard under Paolo Emilio Landi’s direction, the results are hit or miss. As of opening night, comic timing hasn’t completely gelled, though this may improve later in the show’s run. Adam Valentine stands out as the servant Crispin, successfully portraying several characters and accents. His joke at the expense of Chesterfield County is one of the evening’s biggest laughs. 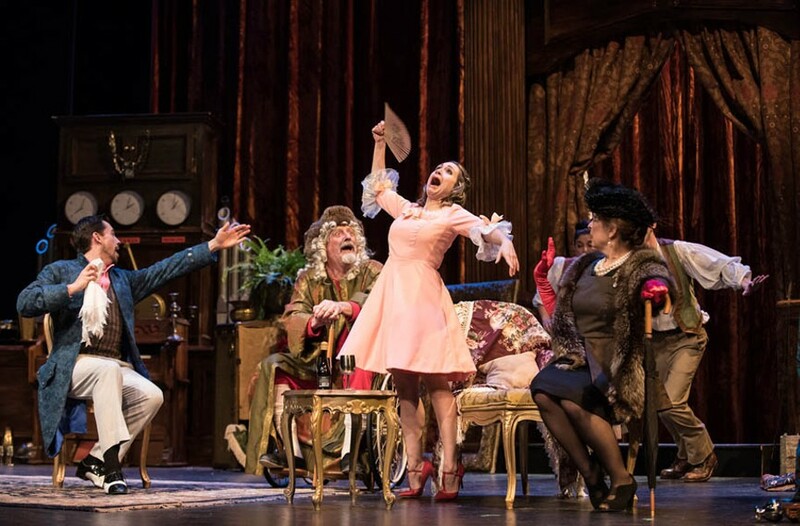 As the grande dame Madame Argante, Boomie Pederson has the appropriate gravitas for the role, making her moments of lunacy even funnier. As for Kenneth Putnam’s lawyer character Scruple, will audience members find that walking around on one’s knees to portray a little person a bit uncouth in politically correct 2017? Elizabeth Weiss Hopper’s costumes are all over the place. Isabella is clad in a frumpy mid-’60s-style dress with a random 18th-century sleeve ruffle, while her mother wears a pseudo 1940s Dior suit. Servants Crispin and Lisette (Sara Heifetz) are dressed as though they’re attending a Renaissance Fair, and Geronte appears to wear a 1940s barbershop quartet jacket in later scenes. Reed West’s set design makes no attempt to emulate the ornate style of 18th-century French furniture. Quill Theatre’s “The Heir Apparent” plays through April 29 at the Virginia Museum of Fine Arts’ Leslie Cheek Theater, 200 N. Boulevard. For information, visit quilltheatre.org or call 340-0115.